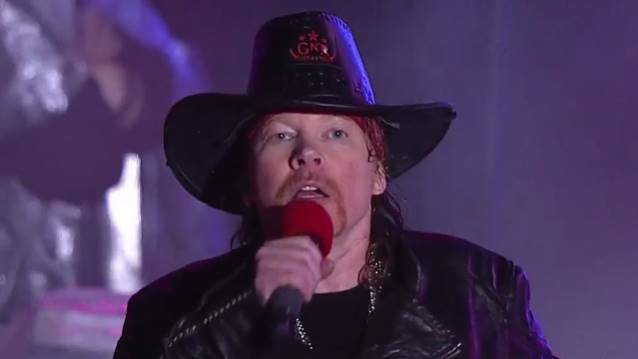 According to a post on the popular GUNS N' ROSES fan forum MyGNRForum.com, Axl Rose's previously announced appearance on ABC's "Jimmy Kimmel Live!" program will no longer take place on Tuesday, January 5. Early Monday, Rose was listed as the show's first guest for the Tuesday broadcast and, for some reason, the GUNS N' ROSES singer's name was removed from the site by mid-afternoon. A moderator for MyGNRForum.com wrote: "[There was] no reason given [for the change of plans]. I sent out an email to someone connected with the band the answer I got back is that Axl will not be appearing in tomorrow night's show. Hopefully we'll hear more in the coming days, so I wouldn't get too discouraged. It's just not going to be on 'Kimmel' tomorrow night. That's all I know." Rose was expected to reveal details of a reunion of GUNS N' ROSES' classic lineup, including plans for a headlining appearance at this year's Coachella Music And Arts Festival and a 25-date stadium tour of North America this summer. Slash last performed with GUNS N' ROSES at River Plate Stadium in Buenos Aires, Argentina on July 17, 1993. 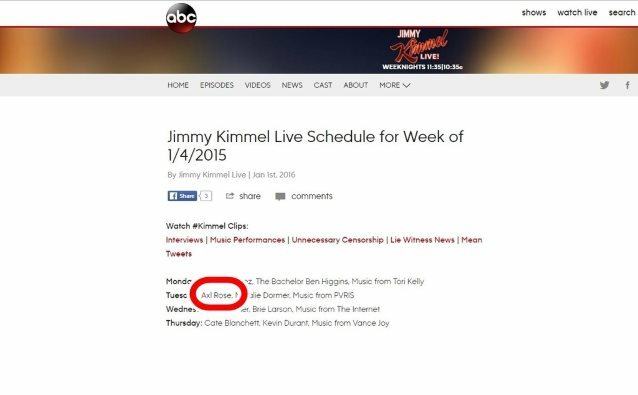 A since-deleted Facebook post from Axl's half-sister, Amy Bailey, urged fans to watch "Jimmy Kimmel Live!" on Tuesday.